Extensive monitoring around all our northern Saskatchewan operations continues to show no significant impact on the surrounding environment. Comprehensive monitoring programs are in place at all Cameco operations in northern Saskatchewan to help ensure the surrounding environment is protected. Samples of water, air, soil, plants and fish are collected from numerous locations around the sites and tested to confirm that environmental protection systems are effective. Monitoring results are submitted to federal and provincial regulatory authorities for review. Cameco also supports independent regional monitoring downstream of its Saskatchewan operations to ensure there are no cumulative effects on the regional watershed. The extensive monitoring undertaken at the all Cameco operations shows no significant impact from those operations on the surrounding environment. Monitoring of streams and lakes downstream of our mines and mills in northern Saskatchewan has demonstrated that the receiving environment remains protected. In addition, air monitoring results have shown that we do not influence regional air quality and that ambient concentrations at our surface lease boundaries are the same as background. 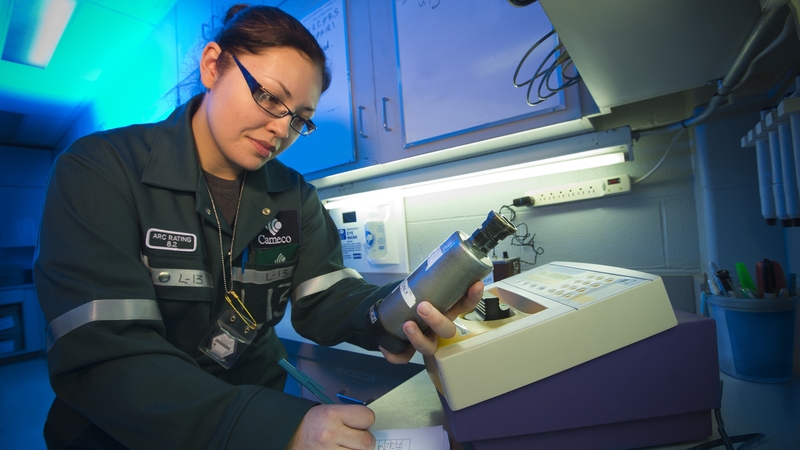 Cameco laboratories process tens of thousands of samples each year. Representative samples also sent away to independent labs for verification of results. Community sampling of country foods taken near communities downstream of uranium mines by the Eastern Athabasca Regional Monitoring Program (EARMP) show these foods are safe to eat.